Gustavs and his three sisters live in Jaunpiebalga. His older sister Sintija has already started school. His younger twin sisters Amanda and Daniela stay at home with their mom and Gustavs. When we arrived we found Gustavs Marcis (or Gustavinsh, as his mom calls him) lying on the couch. His big, beautiful eyes were examining the world around him. He was watching his sisters running around with a smile. At first sight Gustavinsh, who was one and a half year old at the time of our visit, appeared healthy and active. Only a closer look revealed the true nature of his condition. Nothing seemed to be wrong with Gustavs when he was born. However, during one of the first medical examinations his doctor noticed the boy’s head was abnormally big for his age. As a result, Gustavs got hospitalised and underwent his first surgery. Doctors were not very hopeful, but the boy’s mother refused to give up. She did her best and prayed for his health, and the child eventually recovered. However, as is often the case in such situations, Gustav’s immune system has become very weak. The boy is extremely susceptible to infectious diseases. Soon after the surgery Gustavinsh contracted a staphylococcal infection and was given antibiotics. The boy eventually recovered, but the illnesses took a great toll on his health. Gustav’s mother took him to local rehabilitation centres in Gaiļezers and Vaivari, but they were unable to complete the course of rehabilitation due of Gustav’s repeated illnesses. Gustav’s clinical diagnosis is: congenital abnormality of the CNS development, large porencephalic cyst in the left cerebral hemisphere, hydrocephalus, diffuse muscular hypotonia with elements of high muscle tone, delayed psychomotor development. When Gustavinsh is nervous his body reflects the stress. The little boy has to wear orthoses for his hands to develop correctly. Gustavs has motor development problems. He does not yet have a refined grasp, but he does take genuine interest in the world around him. The boy cannot roll over from back to stomach. When placed on his tummy he cannot get up on his hands and stabilise himself since it is difficult for him to hold his head up. The child neither holds his head up well when pulled into a standing position, nor can stand on his feet unsupported. Gustavs seems very eager to move independently, but his own strength is insufficient. The boy expresses emotions and takes an active interest in the surrounding environment. He feels most comfortable in his mother’s and his grandmother’s arms. In early March Gustavs will go to Liepaja to meet rehabilitation consultants from Dižvanagi. The next rehabilitation course will take place in Vaivari this summer. Gustavs is also on a waiting list for a number of aids: special feeding chair, vertikalisator, bath chair and orthoses. One of the most important things Gustavs needs now is a special wheelchair, which will finally enable him to start going for walks with his mom. The cost of the wheelchair is 696.15 LVL. Gustav’s mom raises her four kids alone. Gustav’s father does not live with the family, but does his best to support them when income allows. The most support is needed with the daily care and chores, and grandmother helps with that when possible. However, Gustavs needs regular motor training and massage, which is difficult for a single mom of four to arrange, given the younger kids have not started attending a kindergarten yet. To make matters worse, twins have health problems too – both girls have weak eyesight, and one of them has a heart problem. While we were writing this story the sisters visited an ophthalmologist and were prescribed glasses, since both of them needed a significant vision correction. The cost of two pairs of glasses is 72.02 LVL. Furthermore, the family needs a washing machine badly. They currently do all their laundry manually. Gustav’s mom does a tremendous job, but the strength of even the most dedicated mothers is not infinite. Let’s help Gustavs and his mom! Thanks to all the contributors for the support! 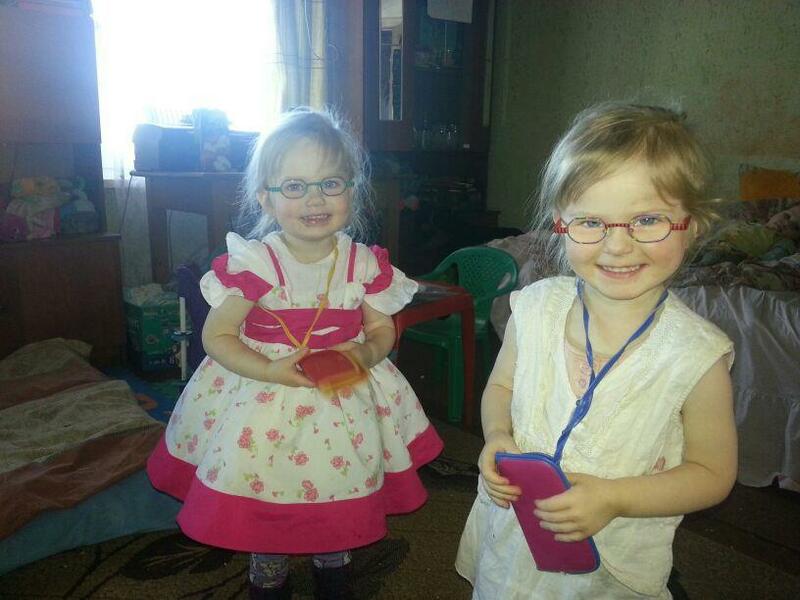 The glasses for the sisters are paid and now we are looking for the most suitable carriage for Gustavs. The paediatrist and neurologist from the society “Dižvanagi” say that for Gustavs it would be very important and of great value to take part in the neurorehabilitation programme. In the programme there is a 5 day lecture course, individual consultation and an individual programme is made up based on the child health situation, also 15 days long summer camp in “Dižvanagi” in Grobiņa area during which practical skills are learned (approbation of the individual programme for each child by a specialist, additional consultations etc.). The programme costs 3000 LVL.